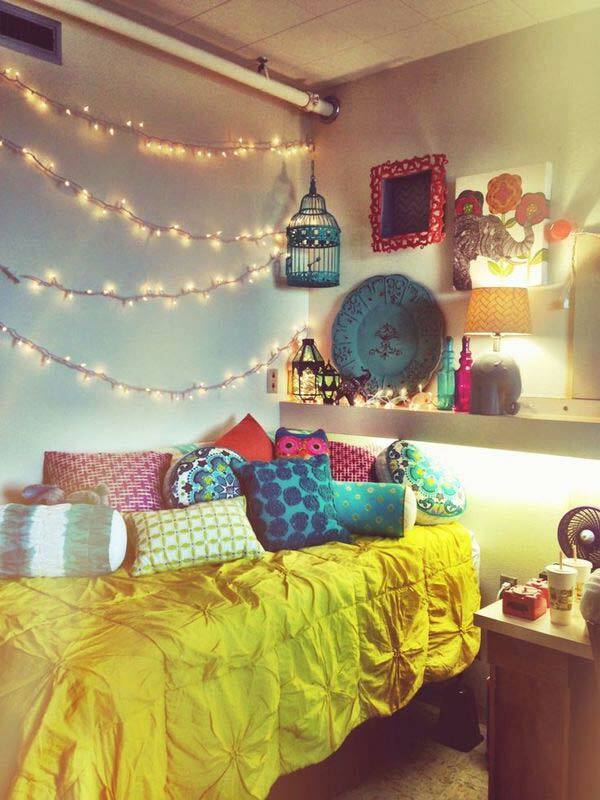 I am obsessing on all the gorgeous bohemian chic looks available in home décor these days! I think what I love most about the trend is the intermingling of various décor styles, architectural periods and time-worn treasures. It can be bright or neutral; vintage or modern; organized or messy; natural or man-made; worldy or home-grown – it truly is a décor style that can blend with everyone’s favorite look. 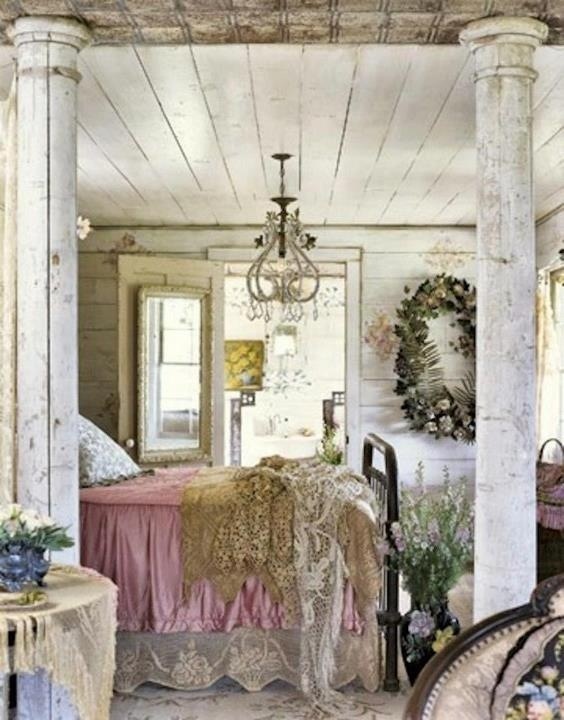 Some of my favorite combinations include: shabby cottage chic + bohemian; mediterranean/global + bohemian; French/Paris Apartment + bohemian; and Floral Garden Chic + bohemian. Being a gloomy, rainy, cold and dreary day in June, I thought today I would focus on the flower-full looks of bohemian décor that are reminiscent of days of Woodstock, peace, love and hippie chic. 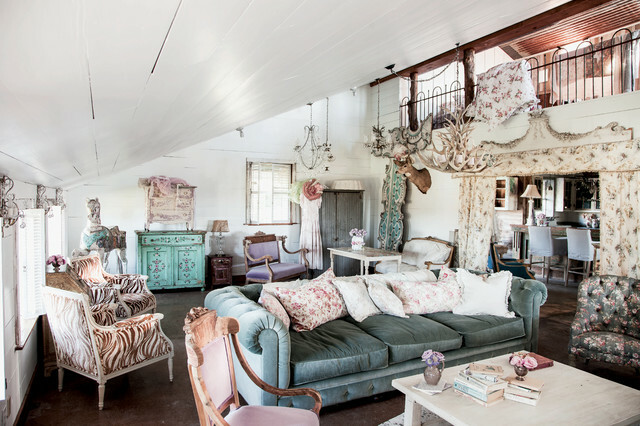 Livin on a Prarie – a peek at Rachel Ashewell’s chic Texas B&B, the Prairie – minutes from the Round Top Flea Market. 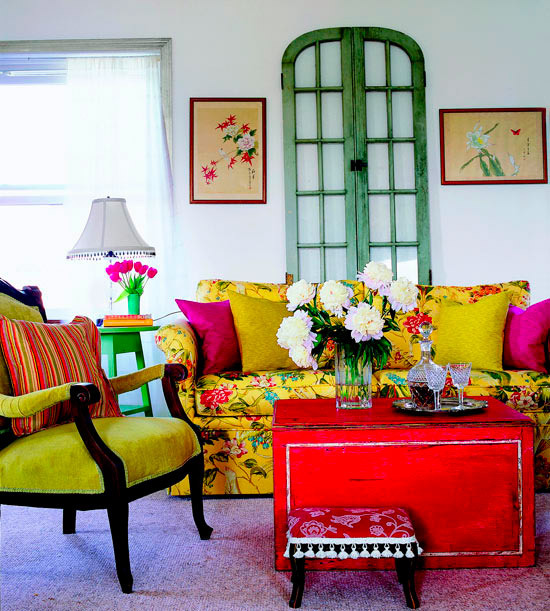 Floor to ceiling windows, floral decals and brightly colored throw pillows make it feel like you are in an interior garden. 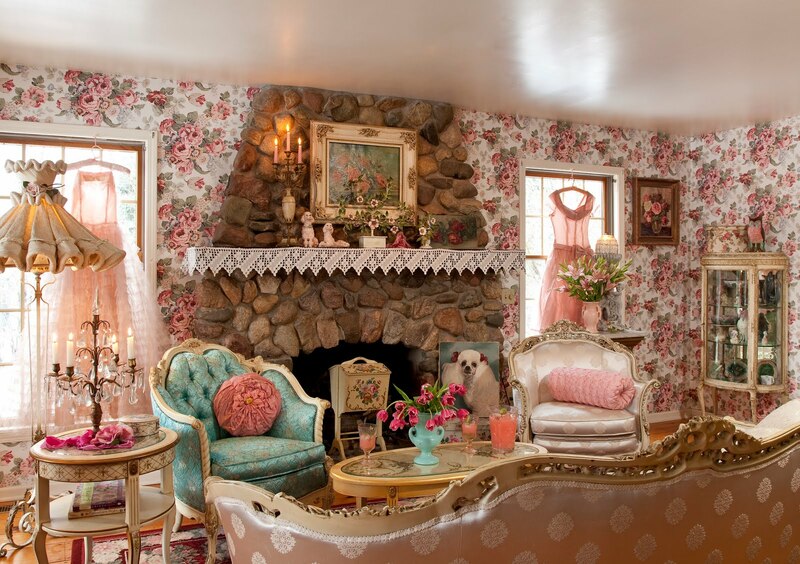 Bohemican Chic fashion designer, Nanette Lepore’s dressing room is just as gorgeous as her clothing designs. 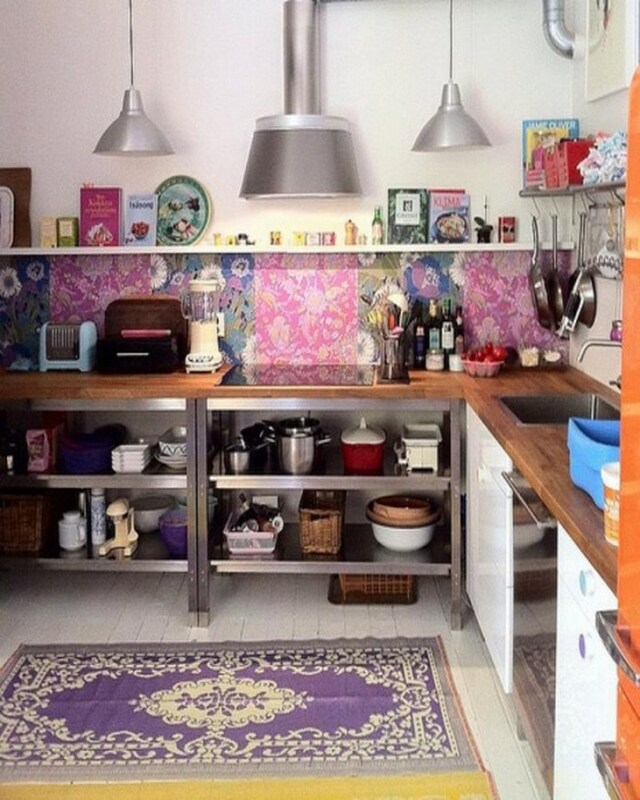 Jewel toned backsplash diy-ed with designer paperstock. 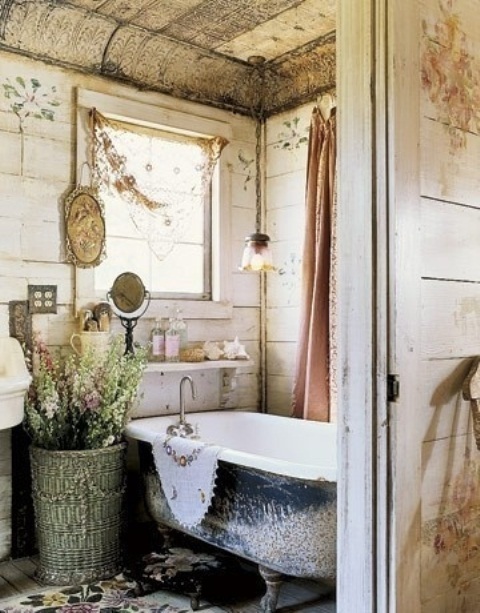 Magnolia Pearl Bathtime – A little bit shabby and a lot chic – from Robin Brown’s cottage, featured in her decor book, A Bit of Velvet and a Dash of Lace book. 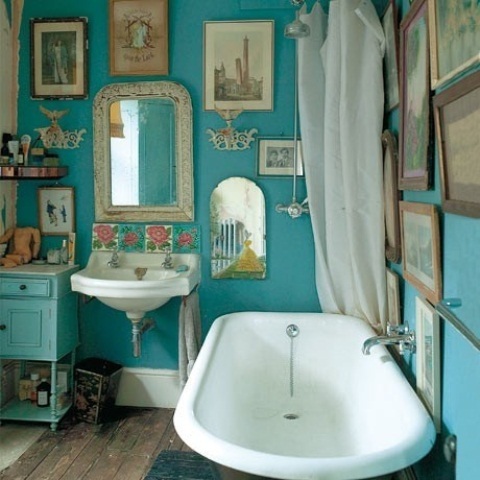 Clawfoot Peacocks – I love the mix of different patterns and colors in this boho vintage inspired bathroom. 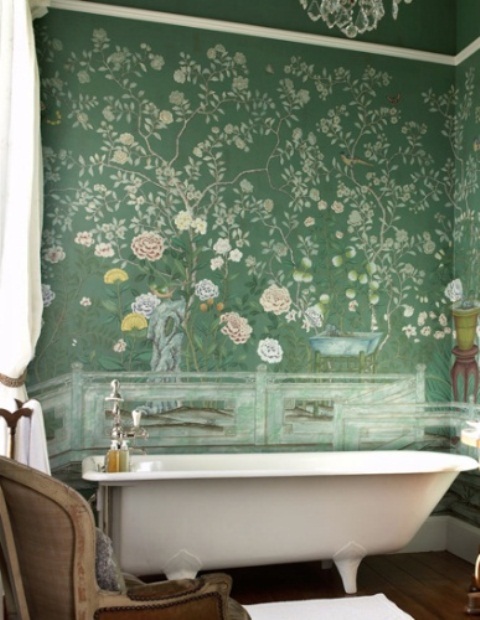 With this beautiful hand painted mural, it’s like taking a bath in a field of flowers. Rock AND roll. This boho glam dressing room is a great example of how opposites really do attract – mixing bright florals with a black chandelier and cowboy boots with frilly frocks. 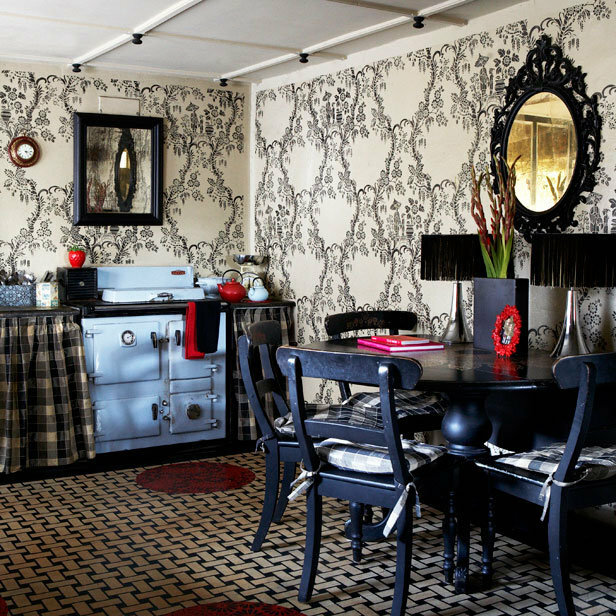 If you never thought that a retro bohemian look could be paired with an ornate French gothic style, this sleek boho glam kitchenette is sure to prove you wrong. 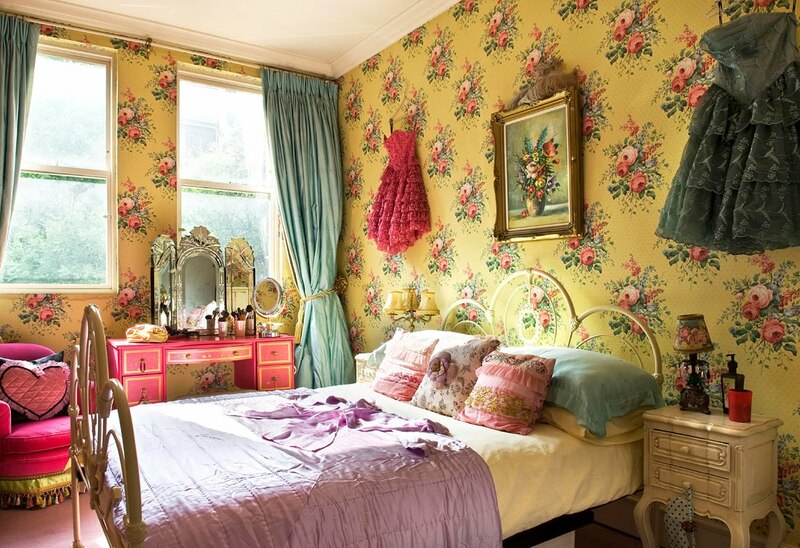 This vintage inspired, ultra feminine bedroom reminds me of Betsey Johnson – the Queen Bee of boho fashion – every time I see it – from the flirty tulle frocks on the wall, hot pink french chic furniture to the bold yellow and big floral wallpaper. 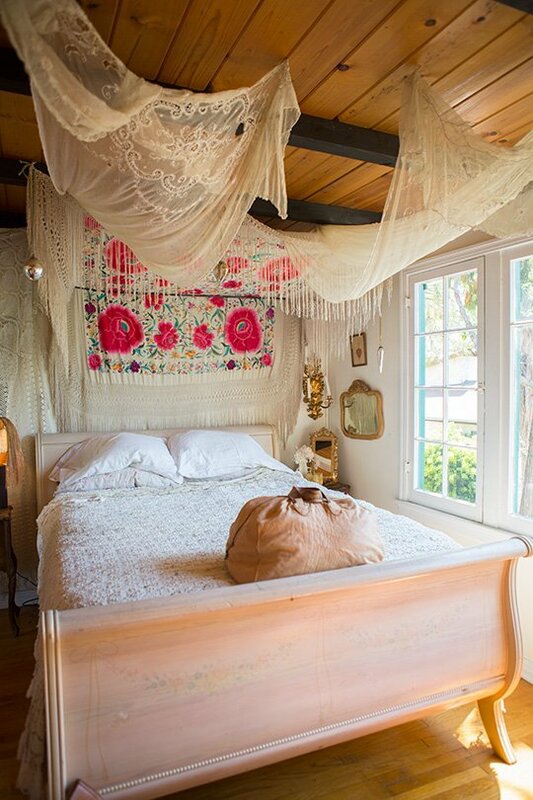 All in the Details – At first glance this bedroom seems fairly subdued until you see the ornate lace canopy hanging from the rafters; the gilded mirrors and wall sconces and the gorgeous boho chic floral fringed bedspread hanging behind the headboard. 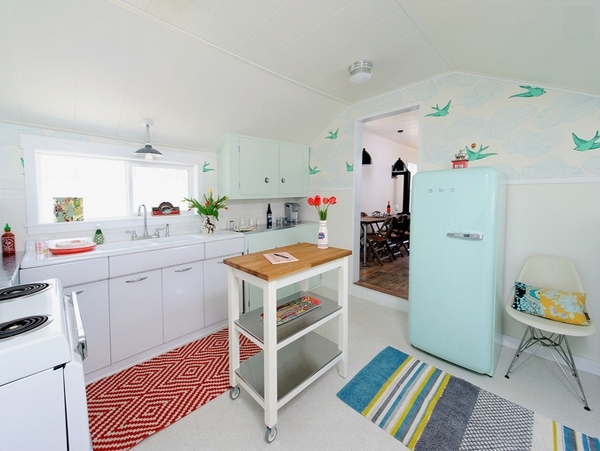 One for my dream kitchen – the retro Smeg fridge – available in a huge assortment of candy colors! 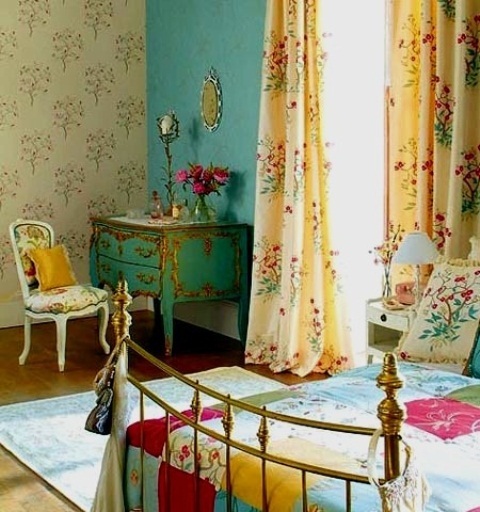 Lovin’ the aqua and gilded French bombay chest in the corner! 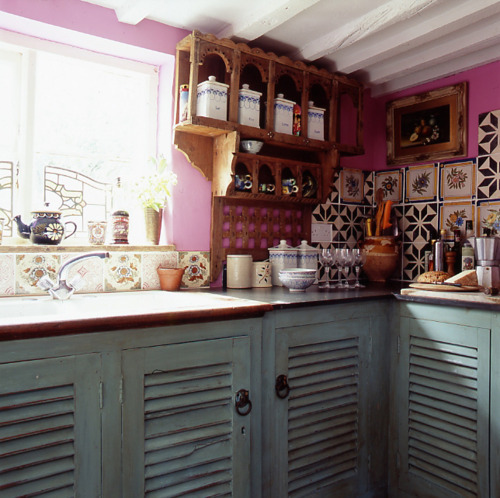 Mixing Shabby cottage chic and bohemian decor with a Spanish flavor – bellísimo! Who would ever want to turn down the lights in this glowing bedroom? 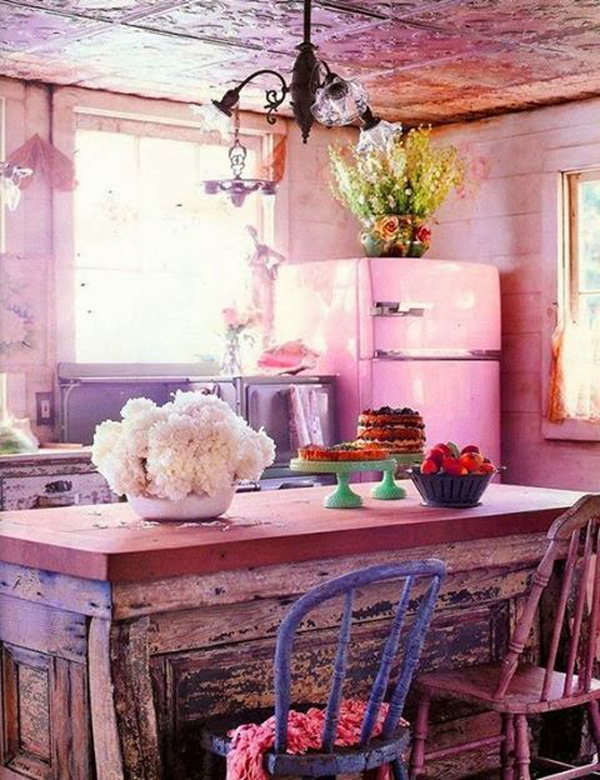 One more peek inside the Magnolia Pearl Ranch – in her book, Robin Brown says she took what was an ugly brown flea market-found fridge to a car paint store and had it dipped in candy pink. 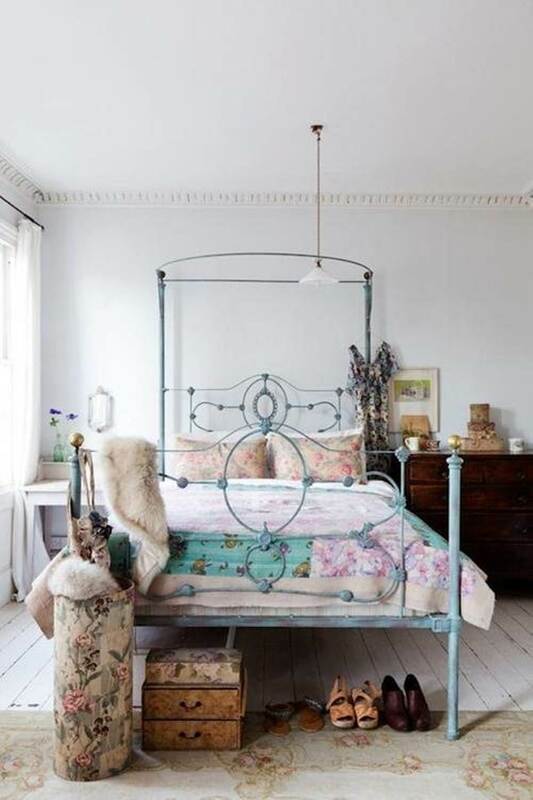 Magnolia Pearl Guestroom – Another look inside Robin Brown’s cottage (that was put up for sale in 2012) – obsessed with this satin pink bed, lace bedskirt and crochet cover. Sugar and Spice. Sweet tones, poufy prom dresses and classic ornate French Provincial furniture prove that feminine decor can never be too flowery. Flower-full from top to bottom. 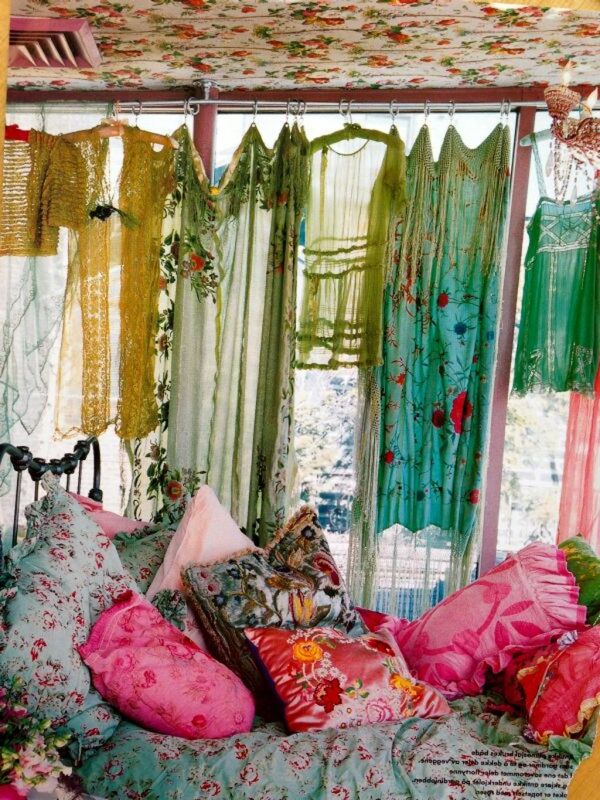 Hippie chic sheer dresses, bloomin’ pillows and even a wallpapered garden on the ceiling.